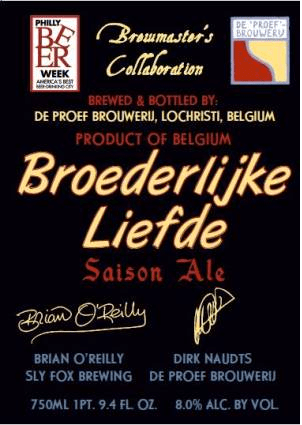 The next edition in De Proef’s “Brewmaster’s Collaboration” series is Broederlijke Liefde. This release is the 5th edition in the series. The collaborations feature Dirk Naughts of De Proef Brewing, Lochristi, Belgium and an American brewer. Past editions include Allagash, Bell’s, Port/Lost Abbey, and Terrapin. Tapping tonight at Cypress Street’s Beer Geek Tuesday the very recent Terrapin/De Proef collaboration “Monstre Rouge” will be tapped. This beer hit shelves late last week and is already hard to find. 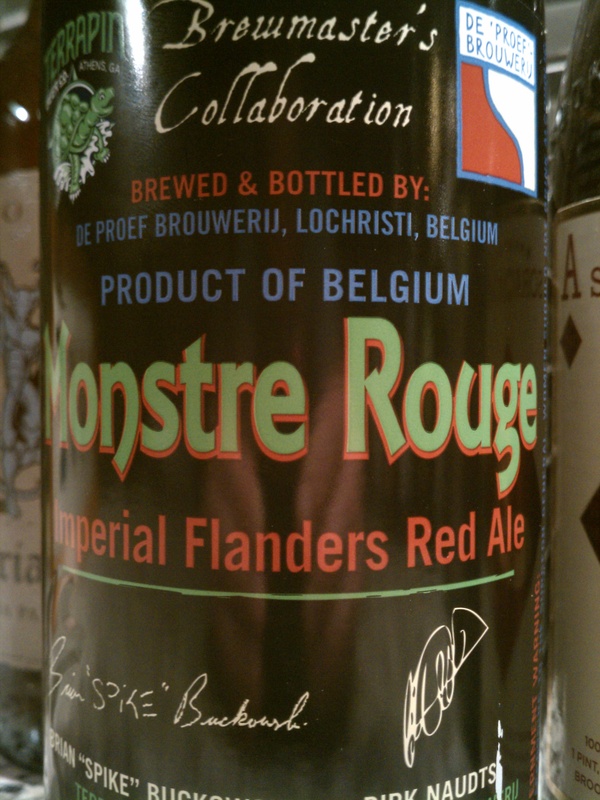 Just to recap – “Monstre Rouge” is dubbed an Imperial Flanders Red Ale. It’s based off of Terrapin’s Big Hoppy Monster, a red ale, with rye malt added. A brettanomyces yeast was added for souring, then it sat on toasted American oak. 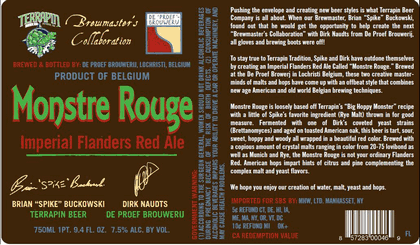 Rouge is a ONE TIME collaboration with famed Belgian brewer Dirk Naudts of De Proef Brewing in Lochristi, Belgium. Grab this beer while you can, it’s a one time offer! Recently, the brewers of Terrapin Brewery (Athens, GA) traveled to Lochristi, Belgium to collaborate with De Proef Brewing. De Proef was found in 1996 by Dirk Naudts. Dirk Naudts is considered one of the leading brew masters in Belgium. De Proef (or “The Prof — Dirk’s nickname) is a highly scientific brewery that melds traditional brewing methods with modern equipment technologies. Versatility is a keyword when describing De Proef as each beer is made in a 9 Barrel brewhouse, which allows each beer to be specially crafted and unique. Dirk’s brewing reputation spawned the collaboration project between De Proef and American brewers. Monstre Rouge is the 4th collaboration with De Proef. It’s an Imperial Flanders Red Ale. Rouge has a lot in common with Terrapin’s Big Hoppy Monster. Imagine Big Hoppy Monster (a red ale) with Rye Malt added. Then instead of an American ale yeast, one of Dirk’s specialty Belgian strains of Brettanomyces was used. There might even be some Lactobacillus in the mix. It is then aged on toasted American oak. Taste Expectations – Described as tart, sour, sweet, hoppy & woody. Complex; with big IPA nose, sweet malts and sour in one big package. Recently, the brewers of Terrapin went over to Belgium to collaborate on a beer with De Proef Brewing. The beer is due out in August, but a cask is premiering today at Brick Store Pub. The beer is an imperial flanders red ale . Spike Buckowski, head brewer at Terrapin states it is based off of “Big Hoppy Monster” a red ale. Spike’s brewing style has a German influence so he added rye malt into the mix. Brettanomyces yeast is used in Monstre Rouge, along with crystal malt and munich malt. American hop strains were used, and as a nice finishing touch Rouge was aged on American oak. This red ale will have a nice mix of both American and Belgian brewing styles. More to follow on this beer as it gets closer to widespread release. 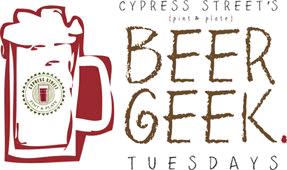 Beer Geek Tuesdays @ Cypress! Cypress Pint & Plate is located in Midtown Atlanta on West Peachtree Street. Cypress is a great, inviting neighborhood bar nestled downtown with a penchant for great beer. That’s exactly where my story starts. Stone Russian Imperial Stout 2009 — Imperial Stout, 10.5% ABV. First released July 2000. This Imperial uses Warrior hops to boost the strong flavors of chocolate & coffee. Released early summer annually. Red Brick 15th Anniversary — Barrel Aged Brown, 9% ABV. Brown ale aged 13 months in Pappy Van Winkle Barrels. Fantastic notes of vanilla and oak, with some caramel malt complexities. One time release. Schneider Aventinus — Weizenbock. (aka wheat dopplebock.) Various vintages will be available. Each release is about 8% ABV. Bottle fermented. Top fermenting yeast used. First created 1907. Unibroue — Based out of Chambly, Quebec. Beers are bottle refermented with a process similar to champagne. Popular beers include – Blanche De Chambly, La Fin Du Monde, Maudite. Various offerings by Unibroue featured. De Proef/Bell’s Van Twee — Belgian Dark, 7.5% ABV. Collaboration between De Proef & Bell’s Brewery. Dubbel blended with Stout, featuring sour cherries from MI. Bottle fermented w/ beet sugar. Schneider/Brooklyn Hopfen-Weiss — Weizenbock, 8.2% ABV. Collaboration between Schneider and Brooklyn Brewing. Wheat, light hop, and light alcohol noticeable. Terrapin —Side Project # 4 — Dos Cocas — American Porter, 5.8%. ABV. This beer was 4th in the side project series and is now retired. Chocolate (cocoa) overlays into this porter for a nice finish. I’m interested in how it aged. Well over a year old by now. Beer and conversation start at 7 pm on Tuesday 2/16! 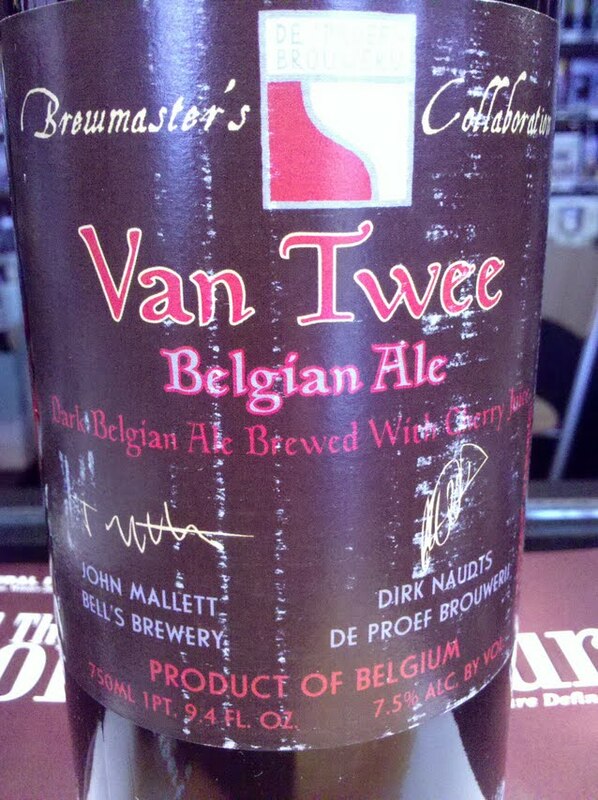 In 1996, highly regarded brewing professor and engineer Dirk Naudts created De Proef Brouwerij near Gent, Belgium. Dirk Naudts is considered one of the leading brew masters in Belgium. De Proef (or “The Prof — Dirk’s nickname) is a highly scientific brewery that melds traditional brewing methods with modern equipment technologies. Versatility is a keyword when describing De Proef as each beer is made in a 9 Barrel brewhouse, which allows each beer to be specially crafted and unique. Dirk’s brewing reputation spawned the collaboration project between De Proef and American brewers. Bell’s Brewing was the most recent participant in the collaboration. John Mallet of Bell’s visit De Proef, and together they brewed Van Twee or “From Two” in Flemish. Van Twee was first a dark brew, resembling a Porter, but also had traits of a Belgian Dubbel. Brettanomyces was used in primary fermentation. It adds to the Belgian flair. Van Twee is the 3rd in the SBS imports collaboration series. Twee will shelf well. Good one for now, and probably better later. UPDATE! A rare cask of Van Twee will be tapping at Taco Mac Metropolis @ 6 pm 1/19/10 with Brewer/Founder Larry Bell.